1st of May commonly known as the Maharashtra Diwas is a state holiday commemorating the formation of the state from the from the division of the Bombay State on 1 May 1960. The day holds a special place in the hearts of all the residents of Maharashtra. We decided to welcome this day with Maharashtrian cuisine at city’s one of the most popular Marathi joint, Prakash Sahakri Upahar Kendra at Shivaji Park, Dadar. Just a minute’s walk from the Sena Bhavan lies this cozy maharashtrian joint, the food of which people have been raving about since decades. We were super lucky to get the table right besides the kitchen. This not only made the service super duper quick but also increased our hogging speed! 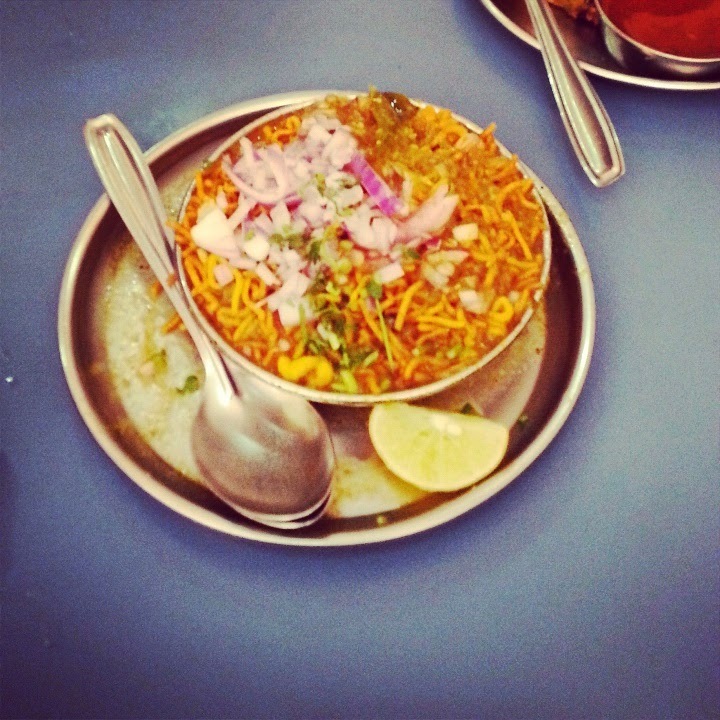 We started our brunch with the Puneri Misal. The misal was full of flavours. It was surprisingly not very spicy which made it more delicious for me. Prakash doesn’t serve Pav with the misal, a first for us. So we ended up ordering puri with it. But mind you, the misal was very tasty in itself. There’s no indeed for pav or puri as such. The next dish that we ordered was Thalipit. Thalipit was on the top of my list of dishes I wished to have. It was just so delicious. It was served hot, a little thick and had mouth water flavours. This reminded me of the thalipit made by my maharashtrian friend Nitish’s mom. She made super tasty thalipit. Need to have those soon. 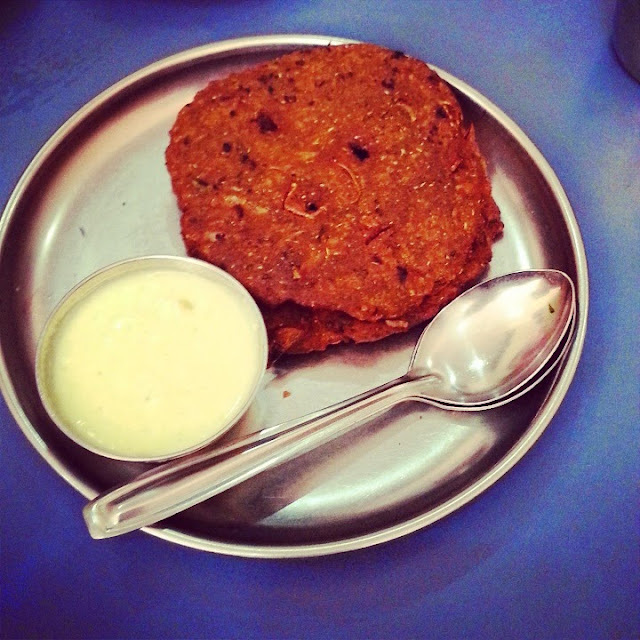 Thalipit at Prakash was served with garlic flavoured chutney which was a lovely combination. We loved it so much that we ordered not one not two but four plates of these. Everytime it was served it got over in fraction of seconds. 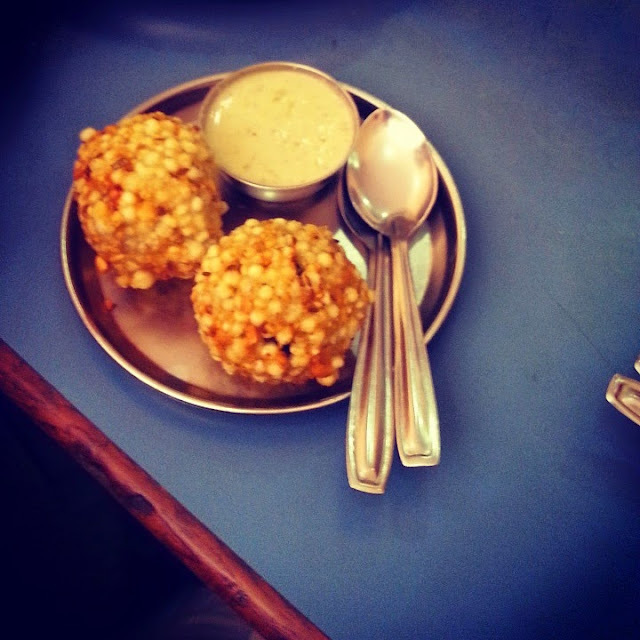 The sabudana wada were delicious and crisp. The taste was just right. The curd based chutney served with it was really nice too. Together they brought out interesting flavours. The best part about the wada was they were not sticky at all unlike at most places. The sago palm or the sabudana didn’t stick in our teeth while chewing which was awesome. The Kothimbir wadi were just wow! These were undoubtedly the best kothimbir wadi I’ve ever had. Lip smacking flavours that’ll make you go just “ummmmm”. Even after it became cold it didn’t feel dry and were easy to swallow even without the chutney. But we highly recommend you gobble them in while they’re pipping hot. The meethi chutney complemented well with the wadis. We liked the wadis so much that we ordered four plates of these too. We ended our delicious brunch on a more delicious note. We tried Piyush, Kokam Sherbet, Masala Milk and Tea. Piyush was a kill!! To give you a feel of what’s it like, just imagine liquid shrikhand. Oh I just loved it. It was slightly on the sweeter end but nevertheless the experience was awesome! The Kokam Sherbet was made perfect. Malasa milk and the Tea were nice too. Our Maharashtra Diwas started on a delicious not. We’re definitely coming back here again. We recommend you all go out and try some marathi dish today. If nothing just go and grab a Wada Pav. Wishing you all a very happy Maharashtra Day. Jay hind! Jay Maharashtra!